Everyone can hit a point where they feel completely overworked and pushed over the edge. 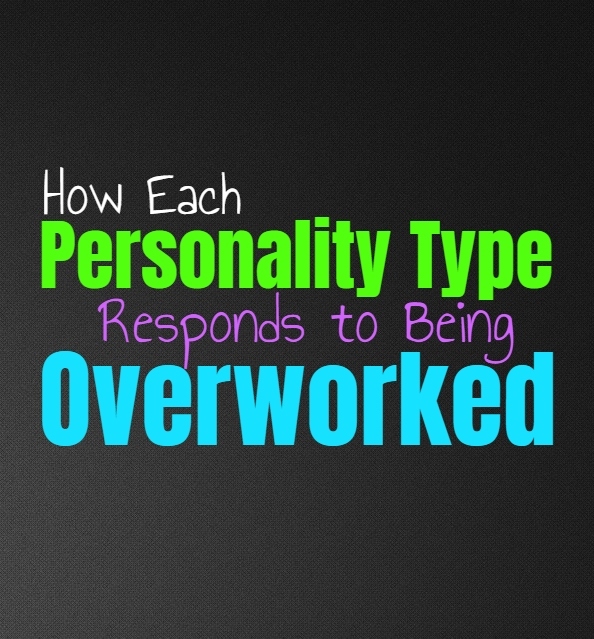 In these situations they will need a break but everyone responds differently to feeling overworked. Here is who you behave when you are feeling drained and in need of some time off. INFJs feel overworked when they have pushed themselves too hard and tried to be perfect constantly. While they might have a hard time admitting that they feel overworked, they will likely start to become a bit short-tempered. The overworked INFJ finds themselves drained all of the time, never feeling like their time alone is really recharging them properly. They might find themselves feeling much more down and depressed about things, not realizing why they are really feeling this way. ENFJs overwork themselves rather easily, since they take on so much at once. When they are overworked they often try to ignore this and continue to push themselves to accomplish their tasks. They may not entirely recognize when they are feeling overworked, since it is so natural for the ENFJ to push themselves too much. They want to take care of everything and work hard to be able to accomplish anything they set their minds too. When they are feeling a bit drained or overworked they might become short-tempered and impatient in ways they would not normally. INFPs who are overworked become a bit forlorn with the state of the world and their lives. They need to have time for creativity and time to themselves without feeling the constant pressures of work. When they don’t get this the INFP can become much more cynical than usual, not really feeling connected to their usual sensitive selves. They might be more on edge and find themselves snapping easier, wanting so desperately to have time alone. ENFPs who have become overworked with appear much love vivacious and fun than usual. The normally creative and social ENFP will seem drained and even a bit distracted. Their minds become so overwhelmed with the work and stress that they need to retreat when they get home. ENFPs are normally playful and fun people but when they become overworked it becomes really hard for them to connect to people and feel like their normal selves. INTJs do often overwork themselves since they don’t like feeling as if they could be doing more. For the INTJ downtime is often research or learning for something personal, instead of something relating to work itself. When they find themselves buried in work they might not behave much differently than normal, since they have a tendency to ignore their emotions fairly often. If the INTJ is feeling drained they might become even more distant from others and will struggle to really connect with them. ENTJs do have a tendency to overwork themselves since they focus a lot of being able to to accomplish their goals. If the ENTJ feels like they are falling behind they will continue to push and try hard to get to where they want to be. They don’t like slacking or giving up on things, but this perfectionist mindset does cause them to overwork themselves. When the ENTJ is overworked they might find themselves more scattered than usual, trying to handle everything when they really should be taking a step back. The overworked ENTJ seems a bit stressed and even on edge, which can make them a bit short with their loved ones. INTPs who overwork themselves can lose sight of themselves in some ways, especially if their work lacks a more creative outlet. They can become so focused on taking care of their responsibilities when this happens, and this can cause them to become a little bit short-tempered with those around them. When they are overworked it leaves less time for them to really focus on connecting with people, since they likely need every moment they can get to recharge and be by themselves. When the ENTP feels overworked it can be difficult for them to process this, since they often bury their emotions instead of really focusing on them. Feeling overworked is hard on them though, since it really makes them feel trapped and stifled. Even if the ENTP enjoys their work they need time to themselves to focus on other creative outlets and so they can become a bit anxious with this. They might not completely recognize that they are feeling drained or overworked, and so they can become a bit scattered because of it. ISTJs do have a tendency to overwork themselves but it takes a lot for this to overwhelm them. They enjoy being able to get things done and feel accomplished in their careers. When the ISTJ it taking on too much and feels underappreciated at work, this is when they feel a bit overwhelmed. They will start to feel short-tempered even in the workplace and have a hard time really communicating this clearly to those around them. ESTJs do sometimes overwork themselves since they believe in pushing to accomplish their goals. They don’t like feeling like they are failing or falling behind and so they push hard to get past any hurdle which is in their way. ESTJs who feel overworked can become a bit overwhelmed since they don’t want to fail at anything and having all of this juggling at once can be stressful. They will try to overcome these feelings but when they are stressed they might become short-tempered and try and delegate to those around them. ISFJs do take on a lot themselves and so sometimes they feel overworked. The worst part about them feeling overworked is when they don’t feel like they are being appreciated enough. When this happens they can become a bit on edge around their loved ones, more than they personally like. They might snap at times when and this often makes the ISFJ feel even worse about the situation. They try hard to prevent themselves from feeling overwhelmed and will keep pushing even when they really need a break. ESFJs do sometimes overwork themselves and seem to take on too much at once. They want to be able to juggle everything so that they can really make their loved ones proud. ESFJs care about being able to accomplish their goals but sometimes they take on too much and find themselves feeling drained and overworked. Because of this they can become a bit on edge, seeming anxious and maybe losing their usual sense of organization. ISTPs who are overworked might seem really anxious and on edge, wanting to find a way to break free. When they do have time to themselves they like want to take more risks and find themselves being a bit reckless in response. They need to get this out of their system and feeling overworked can really leave them feeling stifled. ISTPs need to experience new things and really need to feel like they have some time free to themselves. When the ESTP feels overworked they might try to bury themselves in what they are doing in hopes of maintaining it all. They can start to find themselves falling behind when this happens and will need to do things to really blow off some steam. This might include making a crazy purchase or planning an extravagant vacation. ESTPs need a chance to be a bit reckless, or else they become stifled and feel trapped. When the ISFP feels overworked they really need some time to themselves in order to recharge. They don’t like feeling so stifled and locked into things, and really need more freedom in their lives. ISFPs really need some time to themselves in order to make their own choices, rather than feeling trapped in a stagnant situation. When the ISFP feels overworked they might seem a bit distracted all of the time, constantly thinking of ways to catch a break. When the ESFP feels overworked they find themselves really antsy and in need of a vacation. They might start doing reckless things, like making big purchases or skipping out on certain tasks. This is simply because they feel overwhelmed and drained and really just need some sort of freedom in their lives. ESFPs can’t constantly feel overworked or forced into things, or else they certainly become anxious.